The hexagon shape used throughout the building refers to the chemical structure commonly found in science. After its opening on the 15th of March, 2016, the NCPTS has become the largest and most advanced centre of physical and chemical sciences and technology in the Baltic States. Distinguished by its architecture, the building’s form and spatial planning are united from interior to exterior by a common element, the hexagon chemical structure commonly found in science. For many years Lithuania lacked a centre for physical science and technology that could meet modern demands. Now, attracting top scientists in their creative and innovative endeavours, some 700 scientists and students at a time are able to undertake research while concurrently carrying out experiments at the NCPTS. This state-of-the-art building has a total floor area of 27,000 square meters and comprises five, four-storey buildings that accommodate 250 open-access laboratories, 46 scientific laboratories, flexible office spaces and social areas to relax. AKG Architects explain that space planning plays a key role in the design of complex educational buildings such as this. In addition to providing a wide variety of space types ranging from highly specialised laboratories to flexible work and relaxation areas, modern educational facilities are also required, for example, to meet strict targets with respect to fire, thermal, acoustic and ventilation performance. After discussions with the developers and occupants, the architects determined that as a uniting principle of the design, the building’s complex space planning and functions should register on the building’s exterior, thus linking interior space planning to the overall form and appearance of the project. AKG Project Architect Remigijus Bimba explains, ‘In this project, space planning transfers to the building’s exterior and reflects the spirit of innovation and the progressive attitude of its occupants. The unifying element in achieving this design strategy comes from the structure of chemical elements. 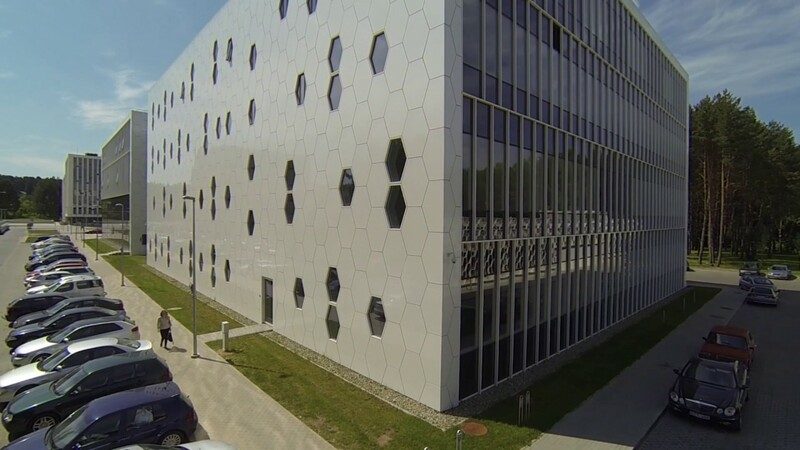 The building is designed for science, therefore we used a hexagonal chemical structure as the dominant element for the building’s exterior and interior.’ Bimba adds: ‘In the scientific world, hexagonal units are connected vertically and horizontally to form primitive cubic shapes. Architectural space planning is similarly modular, with geometric arrangements in plan drawing parallels with the structural model of an atom. Here, in the design of the Centre, building form and space are combined via chemical structure. We kept the composition of the forms linear, clear and strong and combined it with a hexagon chemical structure in the building façades’. The ‘honeycomb-like’ chemical structure that distinguishes the exterior façade of the building was developed in close collaboration between the architects and Reynaers, who AKG had already previously collaborated with on other projects such as ‘Domus Galerija’ in Vilnius. The geometrically patterned façades of the NCPTS are punctuated with top-hung, outward opening, hexagon shaped windows that were realised using a CW 50-HI bespoke solution. The relatively solid appearance of these façades is complimented by spectacular, full-height glazing realised with a slender CW 50-HI glazing system. With a strong linear geometric pattern, this curtain walling design solution fosters connections between the building’s interior and exterior environments. This includes a central courtyard for gathering and relaxation that has been finished, in a similar vein, with hexagonal concrete terrazzo tiles. Moving from the outside in, Reynaers also collaborated with the architects to design the building’s interior components, including transparent partition walls that were customised in order to meet strict fire and acoustic regulations. Bimba explains, ‘The activities of the NCPTS building have a certain performative quality. The spaces are thus united with large acoustic and fire resistance glass walls that nurture an atmosphere of enthusiasm and collective creativity. The building's design was informed by the idea of chemical element structure and the same idea is followed in interior. Some chemical elements are transparent, just like the designed inner spaces. To achieve the desired feeling of lightness and transparency, we designed a frameless, fire-rated glass wall system together with Reynaers.’ The resulting glass wall product was tested in laboratories and certified to achieve the necessary regulatory compliances.